points out"Michelangelo has been called the "Prophet of the Renaissance," and perhaps deserves the title, since he was more of the Old Testament than the New—more of the austere and imperious than the loving or the forgiving. There was no sentimental feature about his art. His conception was intellectual, highly imaginative, mysterious, at times disordered and turbulent in its strength. He came the nearest to the sublime of any painter in history through the sole attribute of power. He had no tenderness nor any winning charm. He did not win, but rather commanded. Everything he saw or felt was studied for the strength that was in it. Religion, Old-Testament history, the antique, humanity, all turned in his hands into symbolic forms of power, put forth apparently in the white heat of passion, and at times in defiance of every rule and tradition of art. Personal feeling was very apparent in his work, and in this he was as far removed as possible from the Greeks, and nearer to what one would call to-day a romanticist. There was little of the objective about him. He was not an imitator of facts but a creator of forms and ideas. His art was a reflection of himself—a self-sufficient man, positive, creative, standing alone, a law unto himself." 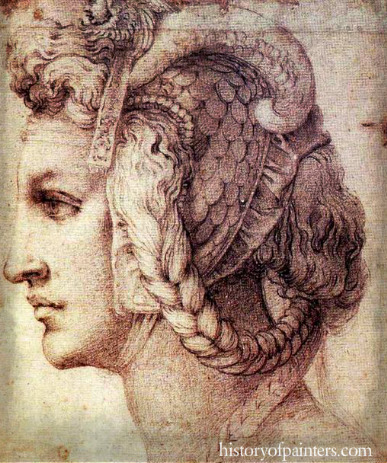 In the story of Michelangelo's life the strength, often turning to bitterness, is not far to seek; a discordant note sounds throughout it which almost spoils the music. He "treats the Pope as the King of France himself would not dare to treat him"; he goes along the streets of Rome "like an executioner," Raffaelle says of him. Once he seems to have shut himself up with the intention of starving himself to death. As we come in reading his life on its harsh, untempered incidents, the thought again and again arises that he is one of those who incur the judgment of Dante, as having "willfully lived in sadness." Even his tenderness and pity are embittered by their strength. We know little of his youth, but all tends to make one believe in the vehemence of its passions. But his genius is in harmony with itself; and just as in the products of his art we find resources of sweetness within their exceeding strength. Michelangelo's art makes us spectators of this struggle; the struggle of a strong nature to adorn and attune itself; the struggle of a desolating passion, which yearns to be resigned and sweet and pensive. In the year 1545 Pietro Aretino, the Venetian author, wrote a strange letter to Michelangelo. As a Christian he disapproved of the freedom which the master had taken in his treatment of the Last Judgment. It was a scandal that such a work should be daily seen in the greatest temple of Christianity, upon the chief alter of Jesus, and the holiest chapel in the world, by the Pope himself. Pietro felt that Michelangelo committed blasphemy in representing the Heavenly Father as Jupiter and the saints as ancient heroes. He pressed the Church to imprison Michelangelo for taking such liberties with holy matters. The Pope refused. Do you know something we don't? If you have comment or would like to share an insight regarding Art History, please submit your comment to the editor, via e-mail and if possible site the source. Thank you!